Yesterday, we heard a rumor that U.S. Cellular will roll out the much awaited Android 4.4 KitKat update for the Samsung Galaxy S4. 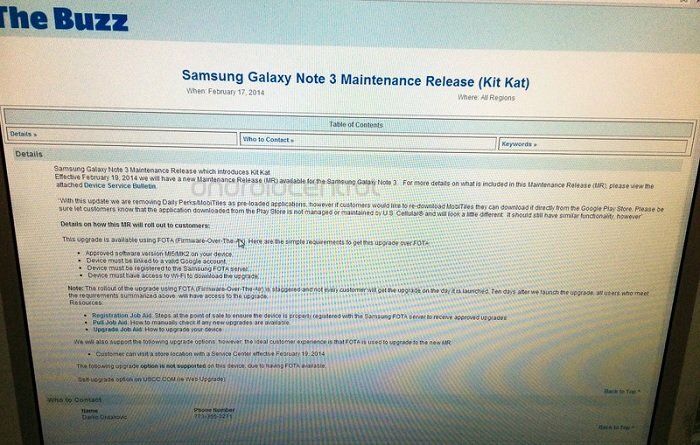 Now, it seems its not just the Galaxy S4, Samsung Galaxy Note 3 will also get the chocolaty taste of Android 4.4 KitKat starting today, if the leaked document obtained by the folks at Android Central is legit. Similar to the Galaxy S4 update, the update for the Samsung Galaxy Note 3 will also roll out in phases. What this means is it’s not necessary that all Galaxy Note 3 owners will get the update on the first day, it will take a few days for the roll out to complete. U.S. Cellular says the roll out will complete in almost ten days and every owner should get it by then. Just make sure you’re on the latest approved version of Android and is linked to a Google account, as well as registered to Samsung server. You will not receive the update if you do not meet the requirements. Additionally, the update removes Daily Perks and MobiTiles apps, which can be downloaded separately from the Google Play Store. If you’re having problems, just pay a visit to a US Cellular store near you and they’ll get you sorted out with the chocolaty update.